What do Mindfulness and Improv Have in Common? This “unusual” pairing came to me during a chance encounter a few years ago in New York. I was exiting Starbucks with a hot brew in hand, before heading back to the venue where I was teaching a Mindfulness workshop that evening. As I stepped outside through the revolving door, I was confronted by a young guy with spiky dark hair. He was holding a pack of flyers. I was in a hurry to get back to my venue and start setup, so I tried to step to the right of the guy to avoid a collision… but there he was again, in front of me. I stepped to the left, but he wouldn’t leave me alone. All I could think of was: “I need to get back to setup my workshop… NOW!”. Frustrated, I looked up at the youth in front of me who stubbornly tried to get my attention. Catching my eye, he fired: “Excuse me, ma’am, excuse me… DO YOU LIKE STAND-UP COMEDY?” Caught by surprise, I blurted out “Do you mean… RIGHT NOW?! ?” He froze for an instant, then exploded with laughter. There we were, creating a perfect Improv moment on a New York sidewalk. After we somewhat recovered from uncontrollable laughter, he asked if I was a comedian too. I said that I wasn’t, at least not by trade, although stand-up and Improv had been a passion of mine ever since the days I studied acting back in Moscow. I told him I was a teacher of Mindfulness, and that I was on my way to teach a class nearby. He looked curious. I added that Mindfulness could make him a better stand-up comedian. He seemed intrigued and an hour later I saw him settling down in the audience of my Workshop as I took to the stage. Stand-up comedians are often masters of Improv. Having him in the audience made me wonder, what it would be like to bring some elements of Improv games to teaching Mindfulness? And this is how the idea of a Mindfulness & Improv workshop was born. On the surface, Mindfulness and Improvisation seem like polar opposites. Mindfulness is often associated with stillness, silence and calm, while Improv brings to mind animated people on stage, laughter and movement. But if you look deeper, you will see that these disciplines are similar in fundamental and fascinating ways. 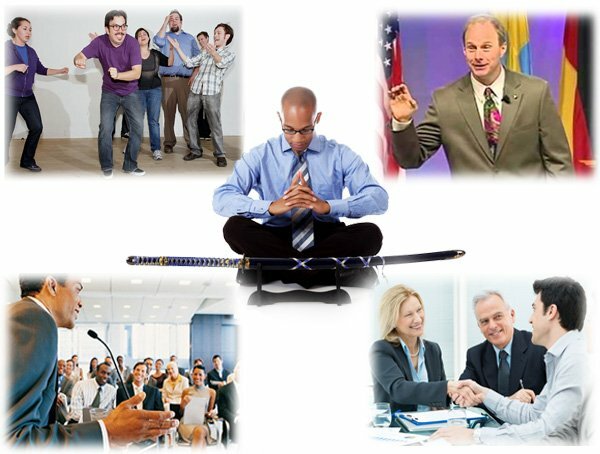 They’re also complimentary skills: to be an excellent improviser you must be able to be fully present in the moment, connect with the flow of creativity within and maintain this focus for as long as needed; to be fully mindful you need to let go of your agenda and be flexible in the moment to allow life (or a business decision, or a speech) to flow and improvise, accommodating unexpected circumstances, twists and turns without losing balance or focus. While actors, speakers and comedians have long known the value of Mindfulness for breakthrough performance, traditional practitioners of Mindfulness might be appalled by the idea of mixing Mindfulness training with Improv games. From my point of view, however, the two fit together hand in glove. Mindfulness reduces stress and increases emotional intelligence. In addition, the form of Mindfulness that I teach as part of Diamond Mind training develops laser-like sustained focus, boosts energy and intellectual vitality. Improv training teaches you how to think quickly on your feet and be your best even in unexpected situations – which is hugely valuable in business and public speaking scenarios. Without the ability to improvise, your business communication could become rigid, out of touch, or irrelevant. Without Mindfulness, you could perform at only a fraction of your capacity – your attention may waver, you may be mentally fatigued, or simply lose the flow of creativity. Both skills, Mindfulness and Improvisation, are paramount to reach your personal best as a speaker, leader or entrepreneur.